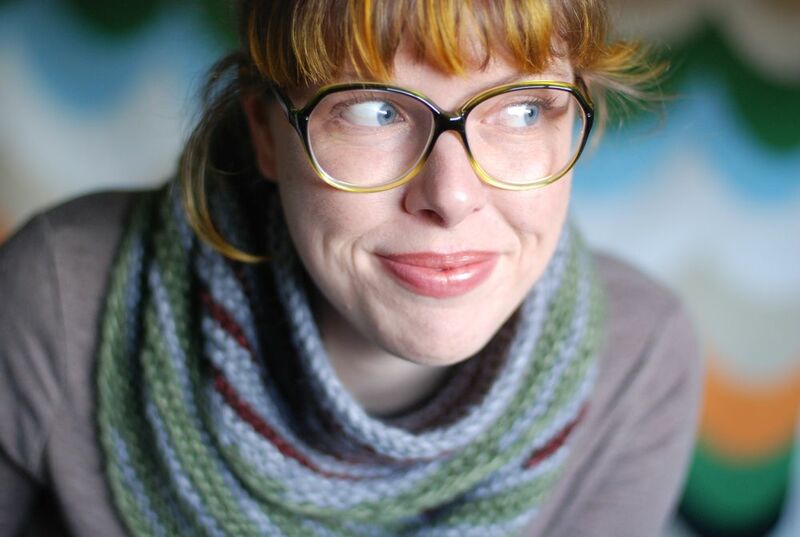 Lee will give away two coupon codes for $6 off any pattern or ebook in her Ravelry store to two readers of this blog. 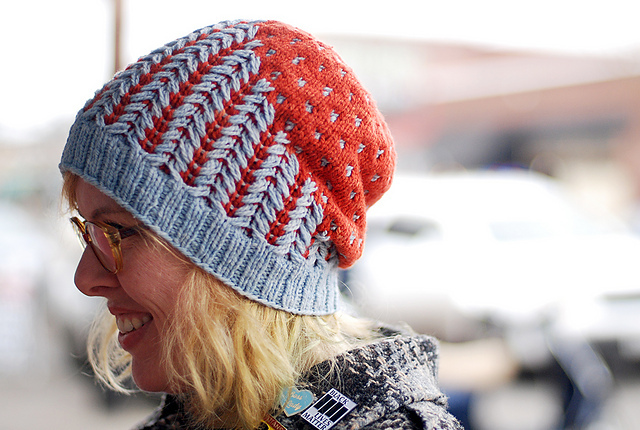 Please comment on this post: Which of Lee’s patterns would you love to knit? 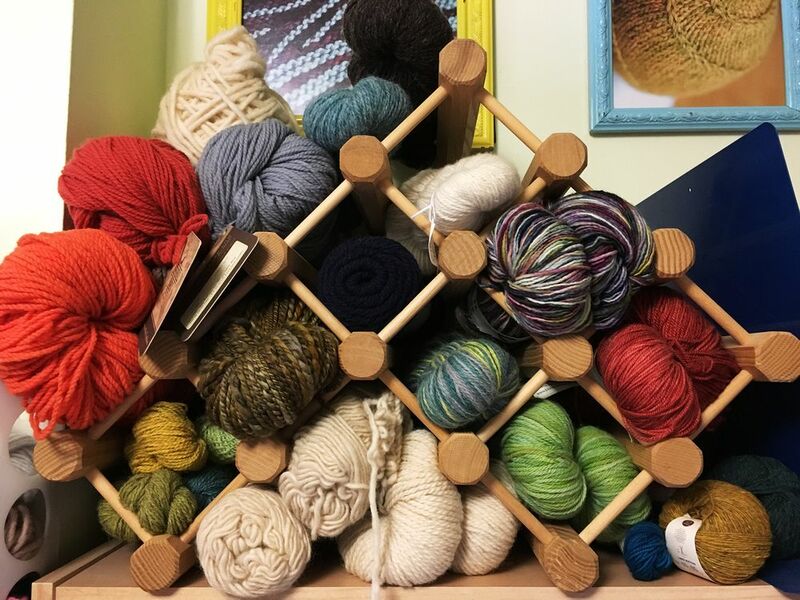 As a lifelong fan of games, puzzles, and art, Lee brings her point of view to her pattern designs, often using unusual constructions, and/or giving the knitter fun options to choose from, and always trying to bring new things into the knitting world and onto your needles! I’ve lived in Portland, Oregon since 2007, grew up in Southern California. I majored in art back in the early 2000s and now I’m back in school to learn graphic design, which I’m enjoying very much. I live with my husband, Pete, and our cat, Garbanzo, in a small, brightly colored house in Southeast Portland. I love pizza and mexican food, and indian food, and pasta… most types of food as long as there’s no meat. I was always crafty since I was a little kid; I grew up weaving potholders, making collages, sewing really basic little things, constantly drawing, etc. I was introduced to knitting in college, in San Diego. I got more into knitting after graduating, and then even more so after moving to Oregon where wool was more practical! 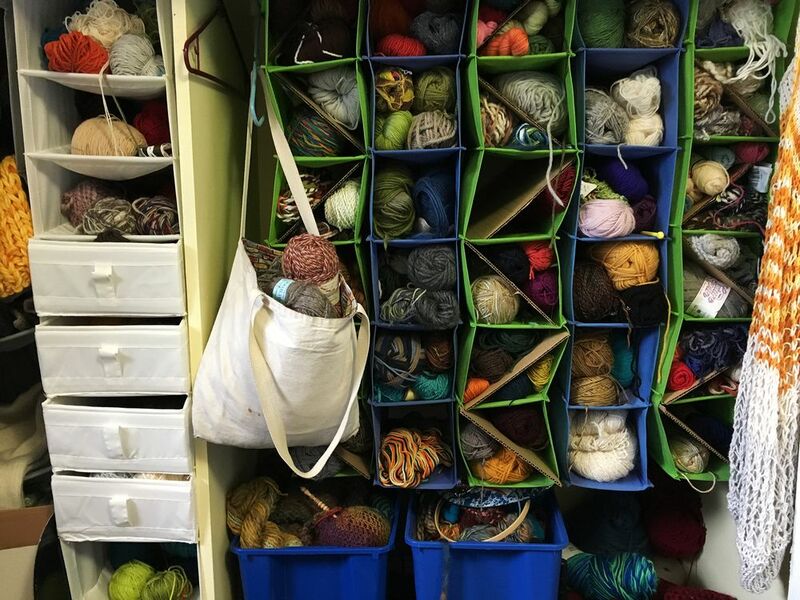 Portland is a very craft-friendly place, so I’ve done tons of various crafty things over the years (I sew a little, embroider, spin and dye yarn…). What was your first ever design and why did you make it? My first ever design that I wrote a pattern for was Entwined, which was published in Knitty in 2007. It’s a pretty terrible pattern; okay not terrible, just super simple and not very practical to actually wear. 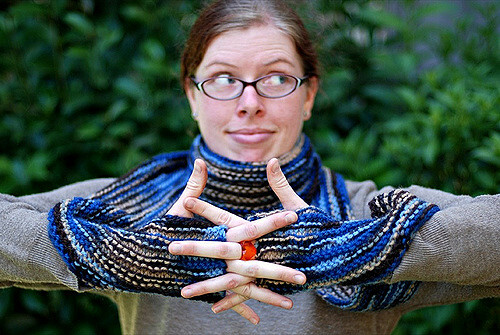 I had been improvising things since I first learned to knit, years earlier, and had barely used patterns at all, so I was comfortable with making up a design but was not very comfortable with the idea of writing a pattern that others could follow. This was a design that was simple enough that I decided to go for it and write it up, and submit it to Knitty, and there my career began! Oh I can’t show the whole thing, because it’s scattered all over the place! 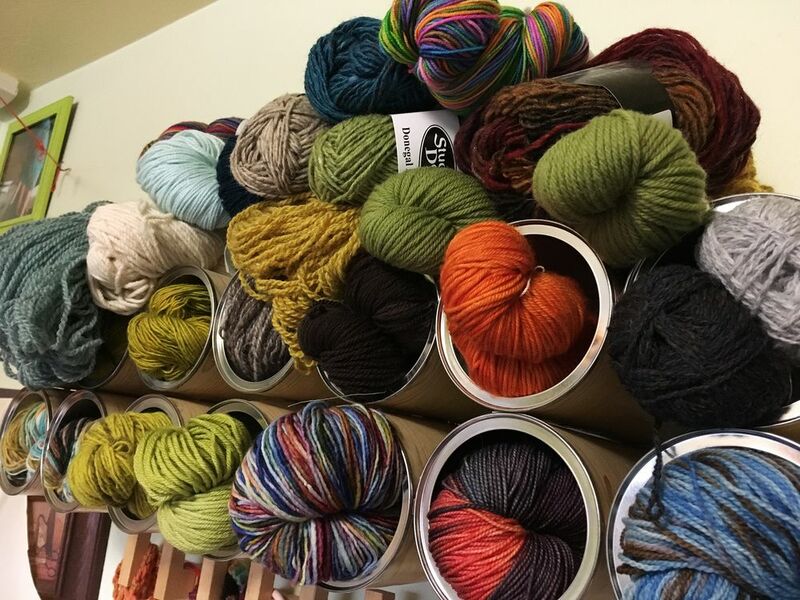 But here’s a peek at the somewhat organized wall of yarn in my studio, and a couple of other fun piles. I’ve been knitting professionally for over ten years, so it adds up! I’m actually working on a knitting (ish) project for graphic design school right now! 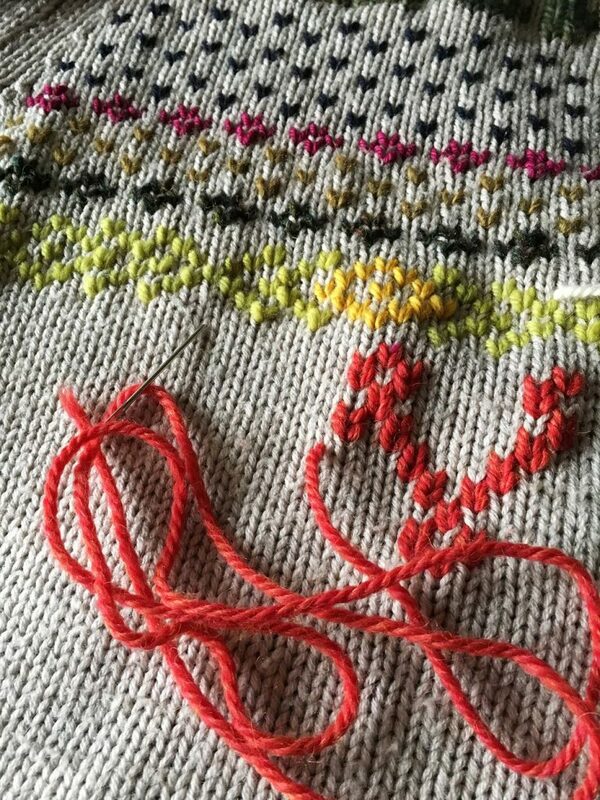 I’m duplicate stitching a whole design for a book cover. I’m pretty into it, it’s looking awesome. I don’t want to publicly show the whole thing yet because it’s for a contest for my school’s literary annual (it’s a class project and then one cover gets chosen to be published) but I’ll show a glimpse! As for actual knitting, I haven’t had time for hardly any since this school term began in September, but I have on the needles a sample of Flit which I’ll be self-publishing once I finish it. I love my Hiya Hiya interchangeable needles — I have the sharps for the small sizes, and bamboo for the large sizes, which works well for me. For designing, a plain sketchbook and a graph paper sketchbook are my favorite tools. I used to use my iPad a lot for designing (mostly the Paper app) but I switched back to real paper after a few years of that. Now that I’m not designing anymore, I am excited to knit some sweaters for myself, from other people’s patterns! 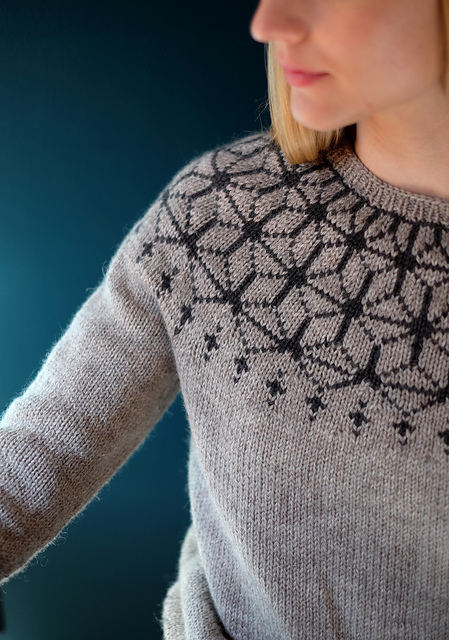 A pattern I just recently saw that I want to knit is Tensho Pullover by Beatrice Perron Dahlen. Gaugeless sweater by Elizabeth Felgate, ugh there’s more but I’ll stop! Too many sweaters, too little time!! 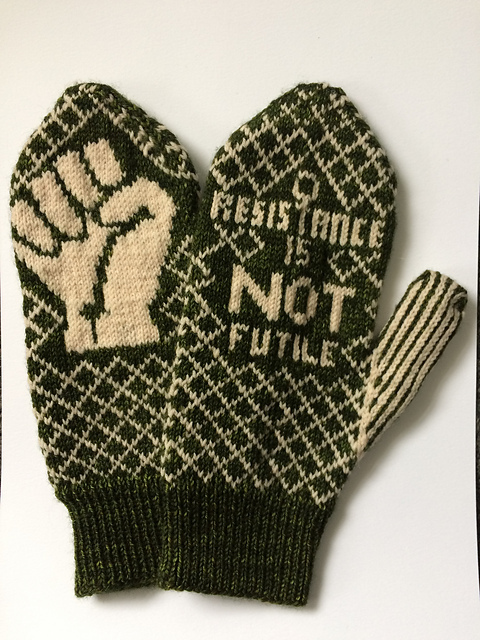 BUT, I’ve been wanting to knit Bristol Ivy’s Peace de Resistance Mittens all year so those will probably come first before any sweaters. Hólm hands down! That baby went straight into the queue as soon as I spied it! It’s just wonderfully different with more than one colour..which I’m trying to improve on beyond the plain navy or grey or cream or or or…. Love the Hólm’s hat. The stitches are so eye catching! And love the color combo you have shown! Congratulations! You have won one of Lee’s wonderful patterns! I emailed you a coupon code. Happy knitting! I knitted Lee’s Either/Or Mitts last year for the GAL and enjoyed the change in construction. I also really like her Ten 10 yard Cuffs. I would like to teach my 10 year old grand niece to knit and this looks like something she would enjoy. I also have lots of small amounts to use up and this is a perfect pattern for that purpose. There are many patterns I like! – I wonder, why I haven’t knit any yet! I like your creative designs, especially Robin. I’m glad you got inspired by it! Happy knitting!